When scanning through the list of wines I have in my Liebherrs looking for a match for confit duck, I really had in mind a Pinot Noir, Beaujolais or Riesling. I also fancied that a top Alsace Pinot Gris with good acidity might fit the bill, but I knew I had no such thing. 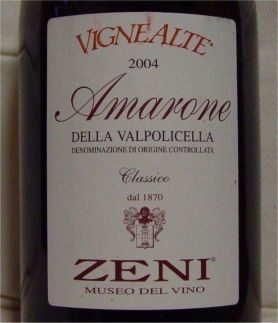 However, I stopped when I found this Amarone as I thought it would be worth a punt. I was pleased with myself for being so imaginative – then a bit miffed to find Google telling me that Amarone is quite commonly paired with duck. I had no idea. I am not sure why it says “Museo del Vino” on the label, but sure enough Zeni do have a museum at their premises just outside Bardolino on Lake Garda. 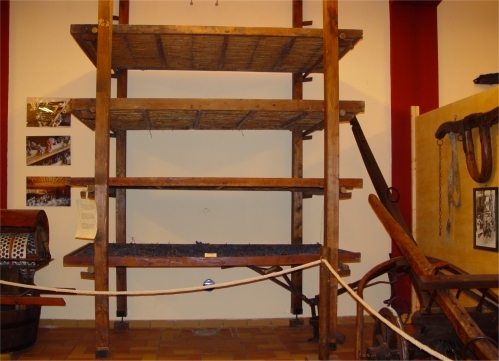 Here is an exciting grape drying rack in the museum. Seriously though, I remember it as being more informative than most wine museums and it is well worth a visit if you are in the area. They also have a large tasting area in the same building. A prior appointment is certainly not necessary, and when we were there I seem to remember the cheaper wines were free and self-service from a machine, whilst there was a modest fee for the better wines like this Amorone. Hmm… maybe they put “Museo del Vino” on the label to get some free publicity. This entry was posted in General, My tasting notes and tagged italy, matching, tasting note. Bookmark the permalink.